Samsung has doubled its shipments year over year to an estimated 56 million smartphones in the third quarter, more than double its closest competitor, Apple, according to a new report from market research firm IDC. 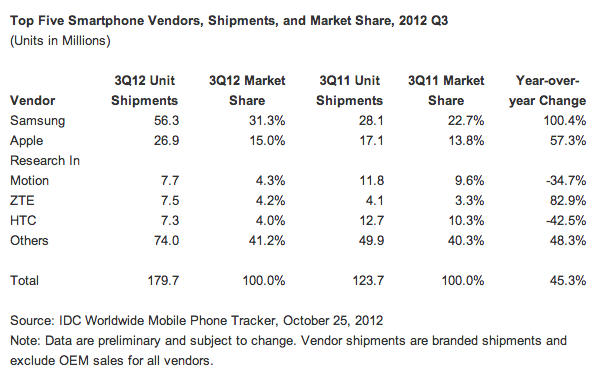 Meanwhile, Nokia continued its fall from grace after it dropped off the top 5 list for the quarter. Apple just announced on Thursday that it had sold 26.9 million iPhones during the third quarter (its fiscal fourth quarter), and it’s no surprise that IDC simply went with Apple’s own figures. The firm believes the iPhone’s showing was good enough for second place with 15 percent market share. Research In Motion took third with expected shipments of 7.7 million, followed by China’s ZTE with 7.5 million and HTC with 7.3 million. HTC had a tough quarter with $2.4 billion in revenue, narrowly meeting forecasts even after having lowered them. Troubled Nokia revealed last week that it sold just 2.9 million Lumia smartphones in the third quarter and a told of 6.3 million smartphones. With the close of the third quarter squarely behind us, research groups have begun publishing a stream of reports estimating vendors’ performance. ABI Research has similar figures to IDC, though it puts Samsung’s shipments at a slightly lower 55.5 million and pegs ZTE in third, followed by Huawei and RIM. Also, Strategy Analytics has posted an analysis on the tablet market that gives Apple a 56.7 percent share and Android a record 41.3 percent. In August, IDC reported that iOS and Android combined to take 85 percent of the market.